A few weeks ago I was listening to one of my favorite podcasts, The Sporkful, and they did a whole episode on how IBM has transformed Watson (the Jeopardy master computer) into a chef. They partnered with Bon Appetit and fed Watson thousands of recipes and food pairings and then Watson uses those to recommend completely new recipes. It’s a pretty wild idea and if you have any fears of computers taking over our society, this is one more step in that direction. 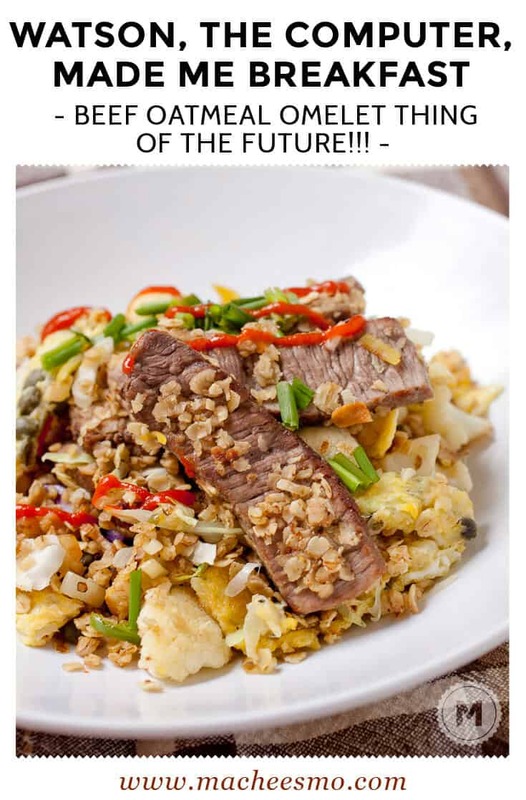 Keep in mind that Chef Watson isn’t just pulling from a recipe database, but is actually making new recipes on the fly. But recipes and cooking are so complicated. I had my doubts and I figured it would be a fun experiment to put Chef Watson through a trial of sorts and see how it did. 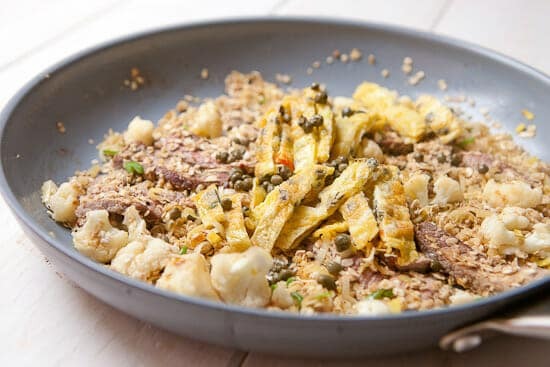 The results had me making an omelet that included, as a start, beef steak, quick cooking oats, capers, and cauliflower. Yes. You read that right. 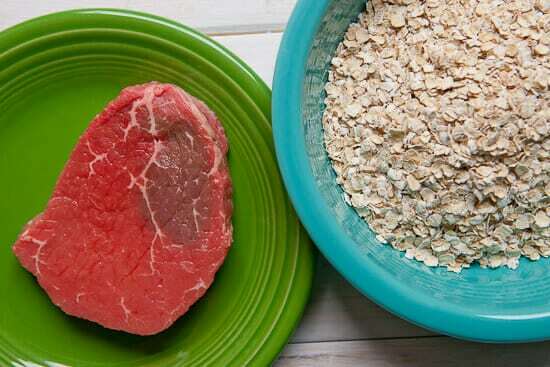 Steak and oatmeal. WHAT COULD GO WRONG?! Chef Watson recommended a breakfast for me so I made it as close as possible, with reasonable substitutions and fixes. It was a memorable meal! Okay. Just stir-fry the stuff together. GOOD LUCK. From the mind of a robot. The Chef Watson website is pretty easy to use and you can request access to Watson with just a few clicks. Then you get to this screen where you can search for ingredients or dishes that you want Watson to work on. I really ramped up the slider bar more toward the “Surprise me” because I wanted something risky and new. The recipe I ended up on didn’t actually have one of my search terms (ciabatta rolls), but did have lots of other interesting things. This is where I hit my first big bug on the site. There were two big ingredients (beef tenderloin and quick cooking oats) that it didn’t tell me how to prepare. It just told me to add them at various steps, but not what to do with them. Am I supposed to cook the oats first? Do I slice the steak? Do I cook it first? Only if you are a mega-computer do you know the answers to these questions. Remember that Chef Watson eats data, not real food. The ingredients and steps are suggestions, so be sure to use your own judgement when preparing these dishes. 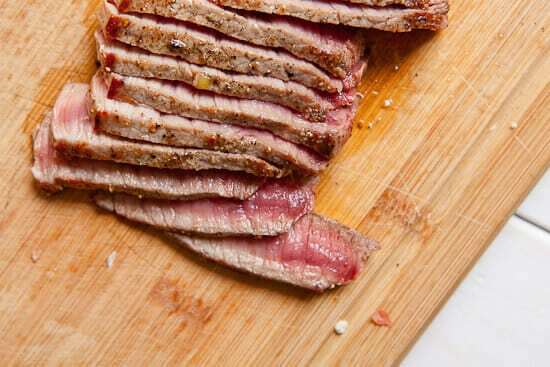 – I seared and sliced the beef. – I did not cook the oats, but also massively reduced the quantify from 6 cups to 1 cup. 6 cups seemed wildly out of proportion to the rest of the ingredients. – I substituted leeks for ramps. – I substituted capers for pickled eggplant. Other than those things, I pretty much followed the recipe! The real thing I couldn’t get past with this recipe was combining steak and oatmeal. At first, I thought it was too weird to even try, but then I remembered two things. First, I asked Watson to give me a surprising recipe. Second, Watson doesn’t have any food memory like we do. This can really work to Watson’s advantage. 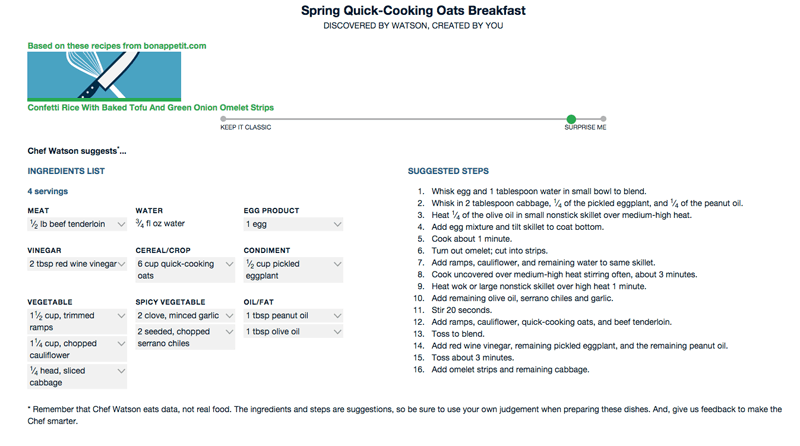 Somehow, his recipe database of trusted recipes led to these things being paired together and while most would toss out the idea, Watson doesn’t because the program doesn’t have years of experiences saying not to mix oatmeal and beef. 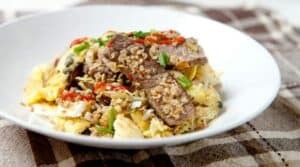 If you read through the steps in this recipe before you start (as you should with any new recipe), you’ll see that it basically ends up being a stir-fry. 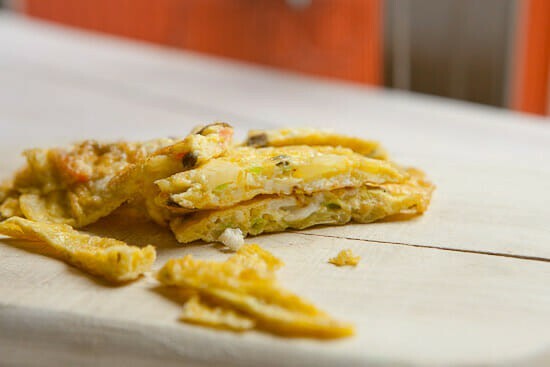 A stir-fry with an omelet. So the omelet needs to be thin and sliced. I followed this part of the recipe as it was written and it worked perfectly. 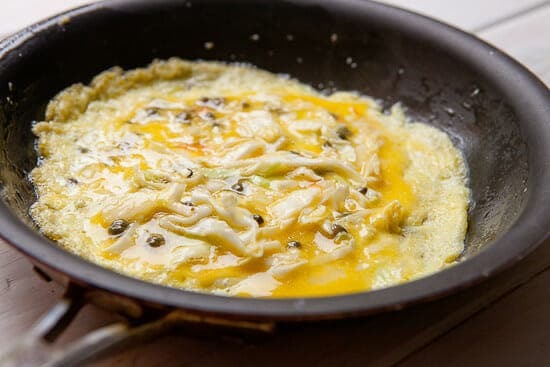 I added my eggs with some capers and cabbage to a hot skillet and let it cook. Then I sliced it nice and thin. This part of the recipe is without a doubt delicious. I was ready to stop here. It was a really great thin savory omelet. I loved the capers in it. This is were the recipe starts to get a bit hairy. 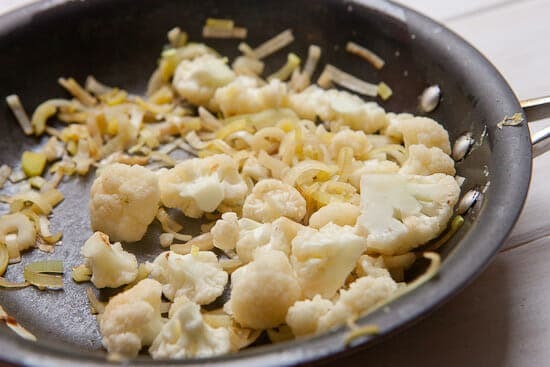 For starters it says to cook the cauliflower and leeks but those two ingredients kind of cook at different speeds. My cauliflower ended up a bit undercooked, but not the end of the world. Meanwhile, I seared and sliced my beef. It was very rare at this point, but I knew I would be cooking it more later so that was the idea. This was a complete guess. I have no idea what Watson had in mind for this big hunk of steak. And so I found myself looking at the weirdest skillet of food I’ve ever cooked. There was some garlic and chili cooked in olive oil first. Then I added the sliced beef, cauliflower and leeks, and quick cooking oats. As instructed, I tossed all this together for a few minutes and then folded in the omelet, more capers, and more cabbage. The oats ended up kind of sticking to the beef and other things making a crust of sorts. I was optimistic. Some sort of hell stir-fry. Even though I wasn’t told to do so, I garnished my omelet beef oat stir-fry with some sriracha sauce and fresh chives. Guys, I ate this and it wasn’t terrible! The flavors were actually right in my wheelhouse. I loved the hearty beef with the pickled capers, eggs, and other veggies. It was better than I was expecting. Even though I was hoping to be pleasantly surprised, I couldn’t get past the texture of the oats. They weren’t bad, but I thought they were kind of overkill. The dish definitely didn’t need them and they kind of just crudded up all the other flavors and textures. I think Chef Watson is really, really cool. It’s not there yet, but using complicated algorithms like this to solve real world problems (health diagnosis, etc.) is definitely the next frontier in computing in my opinion. Recipes are an interesting place to start! I wouldn’t recommend any beginner or intermediate home cook try Watson for actual recipes. It’s not there yet. You have to be able to spot a flaw in a recipe and have a rough idea of how to fix it. Otherwise, you’ll find yourself in real trouble. I would recommend people try Watson to find new flavor combos. I wouldn’t have thought to put capers in my omelet, but I will absolutely be doing that again. If you do try Chef Watson, maybe don’t max out the “Surprise me” meter. Avoid oatmeal and beef at all costs. What do you think? Is Chef Watson going to take over the food world? Am I out of a job?! You are brave!!!! Interesting concept! Out of a job? Hardly. I trust your taste buds over a computer’s database any-every-day. Thanks for sharing resourceful article. I know. That is one downside. Maybe someday they will just open it up to the public. I love how even though this seems like a total disaster of a mash-up of ingredients, you played it beautifully. It looks good … to me, that’s the surprising part. Also, it surprised me that it wasn’t terrible, and for the same reason, I would’ve thought the oats would make it kind of unappealing if not terrible. I’d be inclined to substitute chopped, toasted walnuts for the oats. I agree with you, though, that it’s intriguing as a generator of ideas. I’m interested to check it out! Silly robots. Food is for humans. My dad’s parents were German immigrants back around 1900. Many of our family recipes are German modified by living in the Midwest – and one of them is beef with oatmeal! 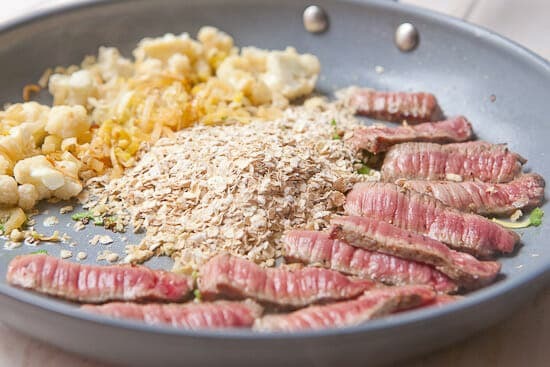 My dad grinds up roast beef with oatmeal to make voost, which you can eat as a sauce over pancakes, or cook a bit more and turn it into a sort of sausage. of course there’s also using oatmeal as a binder in meatloaf or meatballs, maybe that’s what Watson was going for? Whoa! I’ve never heard of that. I bet that’s exactly what the computer was going for. So interesting.